The old joke runs that if you play a country and western song backwards, you get your house back, your wife back, your dog back etc. etc. Today the soundtrack of Whyteleafe left-back Sam Akokhia’s life was that of a country song played in the standard manner, only in funeral march slow-mo, and when I say ‘a song’, I mean ‘an LP’. 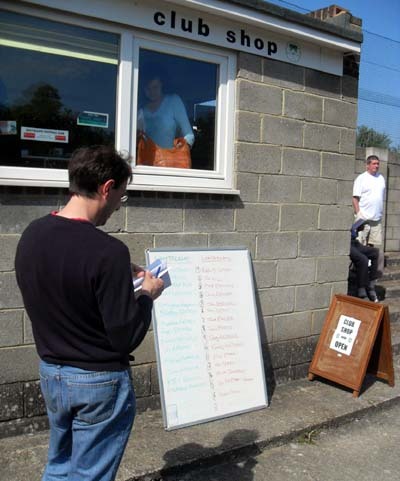 Whyteleafe went into this baking hot Good Friday fixture not entirely certain of their safety at the bottom of the Isthmian South, whilst third place Leatherhead were on a run of five wins in six, and long guaranteed a play-off place. Indeed, the two sides wrestling above them for one automatic promotion spot, Bognor Regis Town and Met Police, go into the final week of the season knowing that being the loser in that battle and having to enter a play-off competition with a side in Leatherhead’s form will be of scant consolation; like missing out on the hamper in a charity raffle and then getting punched in the face for having bought a ticket. With Whyteleafe having conceded 50 goals more than Leatherhead so far this season, and scored 30 less, the promise of goalsch, a resounding away win and a light browning of the arms on the terraces brought a good deal of away support (with a few of us neutrals making the most of the fact our clubs were playing on the Saturday) out to Church Road, the turnstiles (purchased in 1997 from Stoke’s old ground) clicked round at twice its standard rate. 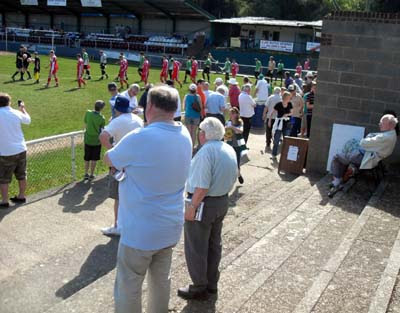 Whyteleafe, in the quiet and leafy Landridge district of Surrey but tickling the nether regions of the London Borough of Croydon like the gusset of a boxer short, is not the kind place you expect to find a knockabout Ryman League ground. Here though, between the country estates, the farms and the stables, sits a couple of stands (one erected in 1999 prior to their hosting of Chester City in the first round of the FA Cup), a club shop selling dusty old Saint & Greavsie annuals, and a PA system reducing a surprising musical choice for this parish of ‘Anarchy In The UK’ to a resigned whisper. Still, whilst this feels like a sleepy place you could happily retire to, the game was anything but hushed, the sun slow cooking the players’ tempers, and Whyteleafe contributing to their own early downfall by, well, selecting the hapless aforementioned Akokhia to play a game I’m not entirely convinced he was previously familiar with. With a whole minute yet to register on the stop-watch, Jack Macleod had stolen the ball from Akokhia as he idly let a cross bobble on his head at the back, threaded across the box to Tommy Hutchings who planted to ball in the top corner to the delight of the vocal ‘Head fans collected behind the goal [see below]. 50 seconds in and the £20 Golden Goal prize already claimed. Ten minutes later, our daydreaming unbeliever at the back was slow to react to a long ball, allowing Greg Andrews to race past unimpeded and score. Now, if anything is going to shake your team-mates confidence in you, it is probably to tear off your shirt and head towards the dressing room. Eventually he was convinced to remain and replaced the shirt over his head, leaving it bunched up over his face for a while to hide his shame. Six minutes later ‘Leafe assistant manager Neil Brooks exasperatedly remarked “jesus, what’s happening…he’s having a ‘mare” as Akokhia went in soft on Hutchings as he stole in at the near post to flick home a third. 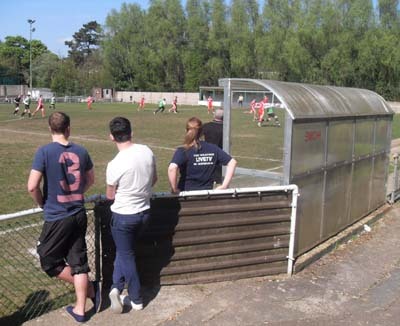 At this point, Whyteleafe gaffer Nicky English bounded around from his position on the terraces, a touchline ban not really meaning much at this level when you can lean over a fence whilst stood about three feet where you would have been ordinarily. Changes were suggested, given the fact that Leatherhead, having found themselves in a DVD extras package of Keystone Kops out-takes, were now pumping everything down the left channel. For lovers of violence, there was to be no wiping out, although the occasional bit of handbags broke out, whilst, more sadly, for fans of slapstick comedy, Akokiah did not survive to see the second half. For a while, this brought a little stability to the Leafe effort and it took until the 63rd minute for the Tanners to get the kind of space they were taking for granted in the first period. Sol Paterson-Bonner barrelled down the right but Andrews crashed the ball into the roof of the terrace. Leatherhead captain Chris Boulter was able to do better two minutes later as after a scramble he battered the shine off it and allowed the net to billow. Five minutes later they made it six when Paterson-Bonner followed up a tip-away by Lidbury from Ken Terry’s cross. At this point, one might have assumed that Whyteleafe might collapse but completely against the run of the previous eighty minutes, they dominated the final ten and were able to score two consolations courtesy of substitute Stephane Gnamore and almost had a third twice in injury time when Kyei Banton made a great run only for Fabien Batchelor to head over then Batchelor, again with his head, hit the post. 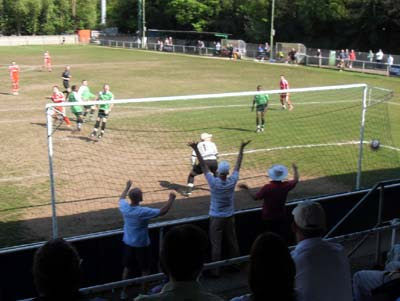 Despite this stepping off of the gas for the final moments Leatherhead will go into the play-offs brimming with confidence while Whyteleafe still require a point from their final two games to be absolutely sure of staying up.